While the Vatican is fading in Europe, according to a recent survey, there is a shortage of priests in the United States, prompting the church to recruit priests from Africa and Asia. The church is experiencing a popularity boom in Asia and Africa that is more than offsetting the losses in the Americas and Europe. Africa is experiencing the biggest growth, with up to 238 percent since 1980 to 198 million. LOS ANGELES, CA (Catholic Online) - The Georgetown University-based Center for Applied Research in the Apostolate said that the global Catholic population has grown 57 percent since 1980. The Catholic Church for the first time tops 1.2 billion. Africa is experiencing the biggest growth, with up to 238 percent since 1980 to 198 million. The Americas remain No. 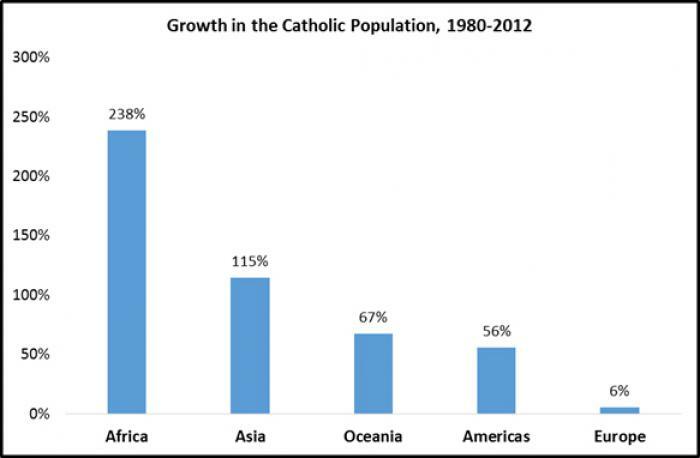 1 with 598 million Catholics and a 56 percent growth from 1980-2012. Europe has experienced only six percent growth. 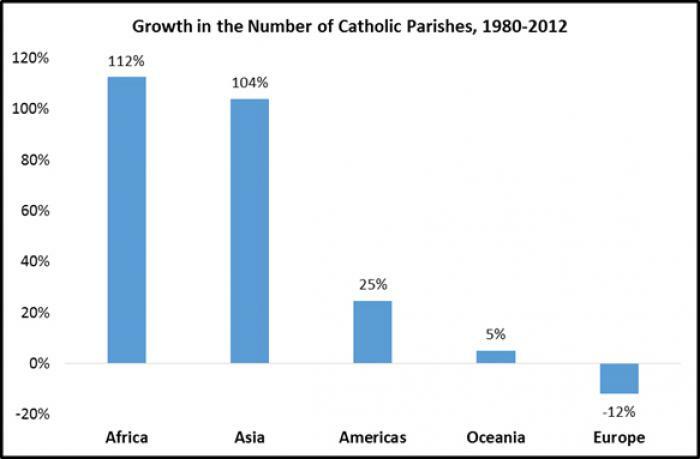 Continents are running short of space and are seeing parish populations surge. In the meantime, in Europe, fewer are attending mass and parish populations are shrinking. 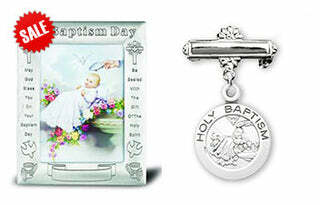 Europe has 122,159 Catholic parishes, Africa 15,217. "The Church is currently undergoing a dramatic realignment due largely to these differential growth patterns," CARA says. "The parishes that served the Church for hundreds and hundreds of years are no longer closely aligned with the world's Catholic population and certainly not it's most frequently Mass attending populations. However, there is no giant crane that can pick up a parish from Europe and relocate it to Africa." 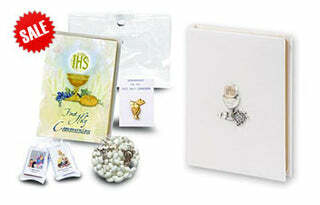 More worrisome, the priest population is down 17 percent since 1980. "The most serious decline was Europe, which had a net loss of 78,090 priests during this period, representing a 32 percent decline in this population," said the report. 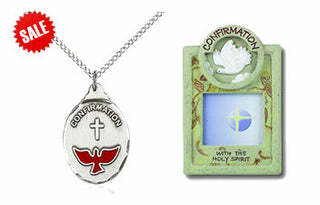 Where the church is growing, there is a reliable and consistent stable of priests. As a result, the church is using that growth to fill gaps in the United States. "A growing phenomenon within the Church is the use of African and Asian priests in the United States, Europe, and elsewhere where there are too few native priests to staff parishes. 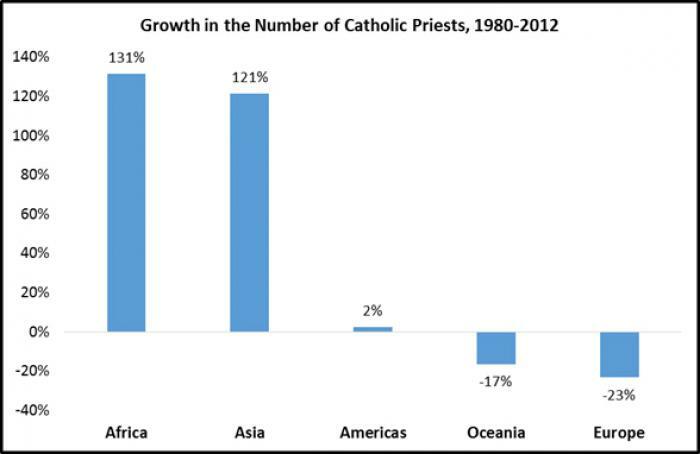 Globally, the ratio of Catholics per priest worsened, as the number of Catholics per priest increased from 1,895 in 1980 to 3,126 in 2012," said CARA.